Spring is here! The time has finally come to get outside and enjoy some long awaited sunshine. As the flowers start to emerge from the soil, we all get ready to capture the spring flower and starts sharing photos of flowers on social media. you to take and share the prettiest photos of different flowers with the help of your Pixel Smartphone. Lighting is key. Check your exposure to ensure you're giving your plants and flowers the right amount of light to see the details. On Pixel, you can easily brighten or darken your shot to get the perfect amount of exposure. Tap the camera, the slide your finger up or down to adjust the exposure depending on the lighting conditions. Consider your frame. Take note of the surrounding area (is it worthy of the ‘gram?). If it’s not, zoom in. If it is, capture a wider angle that shows the full view. On Pixel, you can use a compositional tool to help frame your shot. Look for the grid in the top right of the camera—your arrangement should be at the center of the grid. We recommend 3 x 3 as a ratio for flowers. That Lens Blur, tho. This Pixel feature will make your photos look professional. Start by clicking on the menu bar at the top left; you’ll see the Lens Blur option second from the bottom. 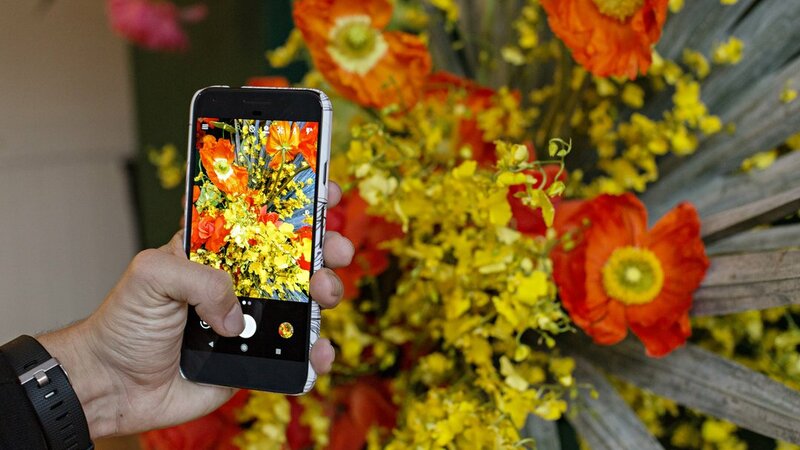 Click on it, take your photo and slowly raise your phone to capture the perfect lens blur. After you snap a photo you can also edit the placement and degree of lens blur. This is a great for up-close shots! Grab a friend. Have him or her pose with your flowers to bring them to life and add depth to the photo. Take as many as you want! With Pixel, you get unlimited high-quality storage with Google Photos for free, so you can try out as many shots as you need without worrying about filling up your phone with dud buds. Find ‘em later. Just type “flowers” into the search bar in Google Photos for a bouquet of photos just waiting to be shared.